In 1970, Marian McQuade initiated a campaign to establish a day to honor grandparents. In 1978, President Jimmy Carter signed a federal proclamation, declaring the first Sunday after Labor Day as National Grandparents Day. 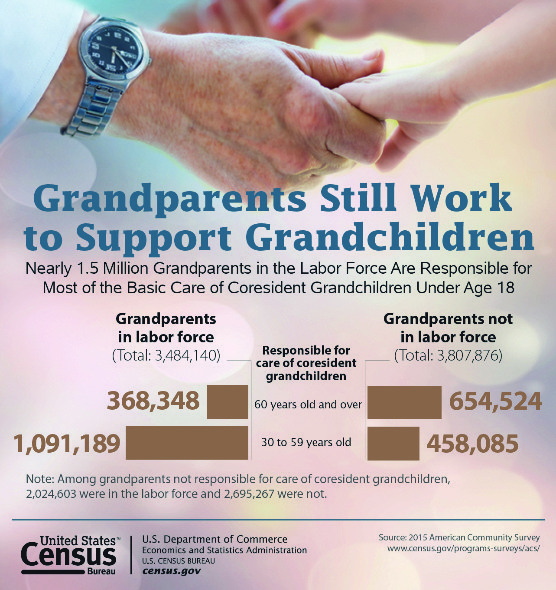 To honor our nation’s grandparents, the U.S. Census Bureau presents statistics about their role in American society as caregivers of their grandchildren. 7.3 million – The number of grandparents whose grandchildren under age 18 were living with them in 2015. 2.6 million – The number of grandparents responsible for the basic needs of one or more grandchild under age 18 living with them in 2015. Of these caregivers, 1.6 million were grandmothers and 1.0 million were grandfathers. 509,922 – The number of grandparents responsible for grandchildren under age 18 whose income was below the poverty level in the past 12 months, compared with the 2.1 million grandparent caregivers whose income was at or above the poverty level. $51,448 – The median income for families with grandparent householders responsible for grandchildren under age 18. Among these families, where a parent of the grandchildren was not present, the median income was $37,580. 642,852 – The number of grandparents who had a disability and were responsible for their grandchildren.